Vancouver BC has agreed to study a follow-on High Speed Rail proposal, joining Washington and Oregon. B.C. will commit $300,000 for their part in the $1,200,000 study (which will take a year or so). Washington has already committed $750,000 to this follow-on study. Washington’s preliminary study, finished Feb 2018, will be followed by this new study, funded by $750,000 from Washington, to more precisely determine the practicality of an ultra-high-speed corridor connecting trains from Vancouver (BC) to Seattle and Portland. The Pacific Northwest Rail Corridor is one of eleven federally designated higher-speed rail corridors in the United States. A Portland and Seattle trip would take 2 hours and 30 minutes at 110 mph. But the $24-$42 billion HSR system may require operating subsidies for the first 20 years or so, according to a WS-DOT report. Advocates say the trip from Portland to Seattle would take as little as 30 minutes (Hyperloop) or about 90 minutes (High Speed Rail). The study looked at three kinds of technology : high-speed rail, maglev and Hyperloop. Three routes were identified: one that would travel through city centres in Seattle and Tacoma before arriving at Portland’s airport (not Union Station downtown). The new study is required to be completed by June 2019. The HS rail — linking Vancouver BC to Seattle and Portland would cost between $24 billion for traditional steel wheels to $42 billion for magnetic levitation (“maglev”) trains, and could attract around 1.8 million riders per year, according to some estimates. An economic analysis released last month — paid for by Microsoft and trade unions — said an ultra-high-speed rail line between Vancouver and Portland would create hundreds of thousands of jobs and billions in economic benefits for the Vancouver-Seattle corridor. Airports instruct travelers to arrive at least one hour early. In Seattle, the light rail trip to Sea-Tac alone takes about 45 minutes and drops off passengers a 10-minute walk from security. High-speed rail passengers might already be at their destination while air passengers are still standing in line at security. High-speed rail, like Japan’s Bullet Train, use steel wheels with an integrated system of specialized rolling stock and dedicated tracks to achieve speeds near 200 mph. China’s High Speed Rail extends more than 17,000 miles, about two-thirds of the world’s high-speed rail tracks in commercial service. Hovertrains ran on a cushion of air, powered by jet engines. In the 1970’s hovertrains were seriously being considered the solution to slow railways. A nuclear powered Bus was the star in a 1970’s disaster movie. Maglev, which uses two sets of magnets, one set to levitate off the rail and one to move the train forward, progressed rapidly with the development of superconductors. But the front-end cost is high for Maglev, and systems are in operation in just three countries; Japan, South Korea and China. Hyperloop, the newest variation of high speed trains, incorporates reduced-pressure tubes in which pressurized capsules ride on air bearings driven by linear induction motors and air compressors. Some are slower (150 mph) and don’t use a vacuum tube. But Hovertrains, Maglev and Hyperloop can’t run on existing rail line, making new service expensive. Why are trains so expensive? In terms of ridership, it’s estimated that 13 to 17 per cent of people who travel the corridor between Vancouver BC and Portland might shift to an ultra-high-speed train by 2035. Depending on the chosen route and mode, annual ridership could range from 1.7 to 2.1 million in 2035, and 2.8 to 3.2 million by 2055. The analysis estimated construction would begin in 2025 and take nine years to complete. Cost, of course is the biggest factor. Elon Musk claims Hyperloop can be MUCH cheaper than Maglev or traditional HS rail primarily because the median strip in the middle of I-5 could be used and their cars are smaller, lighter and faster. All three HS rail options would use electricity rather than diesel-electric power. 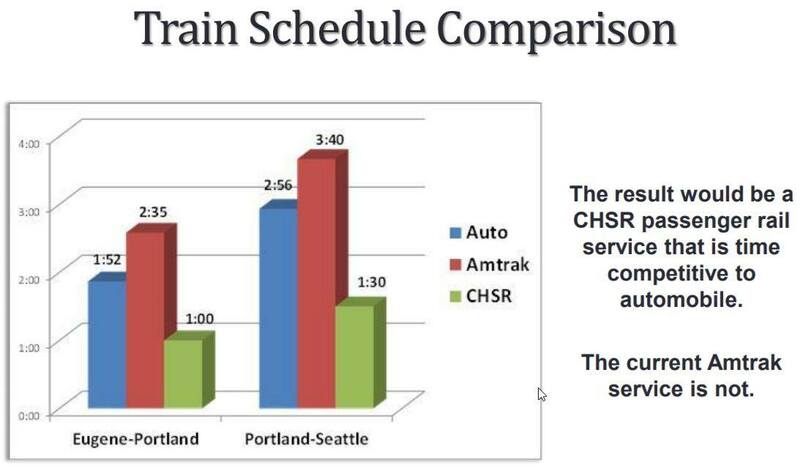 The study that appears to have the most documents is the (traditional) rail proposal by Cascadia High Speed Rail, a private group that is NOT associated with Amtrak. It would cross Hayden Island near the old railroad bridge and parallel to it. Cascadia High Speed Rail would terminate in Portland at Memorial Coliseum, NOT Union Station or PDX airport. Cascadia High Speed Rail is a private for profit limited liability company and has developed a conceptual plan for a 460< miles high speed rail corridor in the right of ways of I-5, UP, BNSF and other private/public lands. It will contact private parties, legislative members, mayors, governors and others, in an effort to secure private and public funds to pay for CHSR corridor development. The Cascadia High Speed Rail plan would seismically upgrade the existing I-5 Bridges for another 75 to 100 years of life and build a new multi-modal bridge one mile west of I-5 (next to the current railroad bridge). Their new RR bridge would support three “lanes”, one for for HS rail, one for UP/BNSF freight, and one for motor vehicles. Cascadia’s estimated cost to build (excluding land cost) of the 11 mile corridor from the Portland Rose Quarter to Lakeshore Vancouver WA is estimated at $2.1 billion. How Maglev and Hyperloop may impact Hayden Island is still unknown. The only “serious entry” into Hyperloop technology is HyperLoop One, a startup founded by well-known, successful high-tech entrepreneurs who so far have managed to raise $160 million from venture capital and other investors. HyperLoop One has also obtained serious interest from the United Arab Emirates for a proposed line between Dubai and Abu Dhabi. A significant twist in HyperLoop design and operations compared to Elon Musk’s original proposal is addition of a “personal rapid transit” (PRT) element. HyperLoop One’s HyperLoop capsules would be able to accept different kinds of cargo and passenger pods, including cargo containers, pods designed to carry different classes of passengers, self-driving cars, and even human-driven cars (e.g., in a manner roughly analogous to Amtrak’s Auto Train). The electric-powered “skates” carry ordinary vehicles or people movers that carry up to 16 passengers at speeds of up to 150 mph. Each HyperLoop station could be designed with numerous docking bays to load and unload various pods, some including cars. Self-driving pods could also travel from their origin, automatically boarding a HyperLink capsule, and reversing the process at the destination city. – The Portland-Milwaukie Light Rail cost $1.5 billion for 7.3 miles, or $205 million per mile. – Chicago selected Elon Musk’s Boring Company to design and build a high-speed underground transit system linking O’Hare to downtown. The 8 mile line would cost $1 billion or $55.5 million per mile – far lower than most recent tunneling projects. Musk promises to self-finance it. What’s intriguing, but not really addressed, is the Hyperloop option. Musk says it would be cheaper, since cars are smaller and it (mostly) uses the median of I-5. The initial Washington study did NOT factor it in. They said there’s not enough to go on and that Hyperloop may not be ready to go in 8-10 years, when the Green Light for construction might be made. Cascade Highspeed Rail, by contrast, is a for-profit LLC, pitching their own steel-wheel proposal on leased BNSF rights of way. It is not a part of the government study, but hopes to get government funding. Critics might say HS rail using steel-wheels just doesn’t offer enough advantage (180 mph) to pay for a whole new railbed, while Maglev is too expensive ($42 billion). But if Hyperloop can promise faster service for $10-$12 billion (half the cost of tradition HS rail), shouldn’t they be given a chance? Perhaps the Port of Portland will try to kill Maglev and Hyperloop, because of the competition with air travel, but should they? Sky Taxis are probably inevitable. Sky Taxis will take you to an airport terminal (where the HS Rail terminal is located). Sky Taxis may be an opportunity for both the Port of Vancouver and the Port of Portland. Larry Page’s third flying car company will sell its first craft in 2019. Sky Taxis will arrive sooner than HS rail or a new I-5 bridge. Guaranteed. In my vision of the future, you’d take a 15 minute flight in the Sky Taxi to a Hyperloop terminal near PDX. Then it’s a 30 minute ride to Seattle Center. You’d beat the Portland/Vancouver snarl on a commute to Seattle. The Port of Vancouver could be a transportation hub. Trains, boats and flying cars. Amazon it. It’s estimated that 13 to 17 per cent of people who travel the corridor to Seattle or Vancouver BC may shift to an ultra-high-speed train by 2035. That’s a big hit for the Port. But combining Air and HS rail traffic along with landing fees from numerous Sky Taxis may mediate airline losses. It’s synergy. Catch the wave. Catch a plane or catch a train. User convenience is the bottom line. Besides, Sky Taxis will arrive LONG before HS Rail, which is 20 yrs out.